Hi there, how’s your summer going? 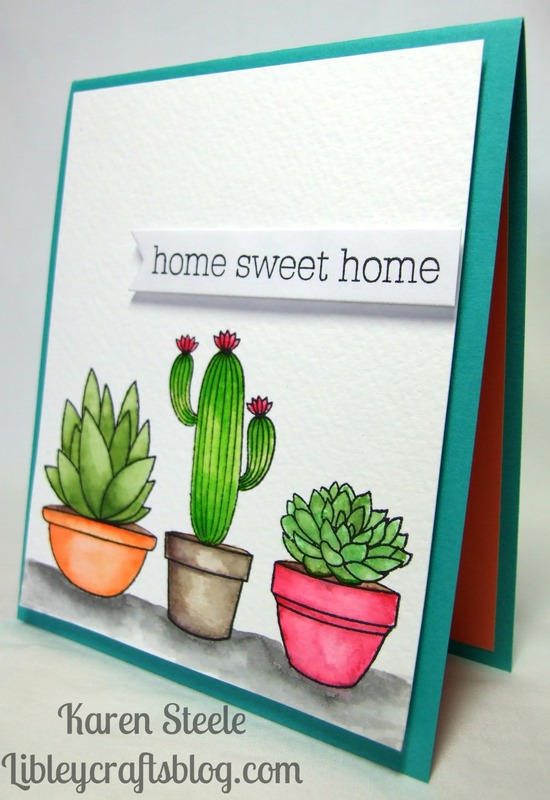 Now school is out I will be posting once a week so here is a little card that I have made using the Sweet Succulents stamp set from My Favorite Things. When ‘succulents’ stamps first start appearing I did wonder why would you want to make a card with these images! However, the more cards I have seen – especially one’s that have been water-coloured – the more it made me kind of want a set for myself! I chose this set because the pots are all separate images so you can mix the plants with whatever pot that you want. You can get the dies to match but I just did some fussy cutting here. I have coloured these images with Spectrum Aqua Markers. The sentiment stamp is from Waltzing Mouse Stamps (no longer trading) and for the pop-up element inside the card I have used the Mama Elephant Pop-up Creative Cuts dies. The card base was made with Lawn Fawn cardstock and the inside was paper from my stash. The banner die is from Lawn Fawn too. Next > Another Cool Penguin! FUN Card, Karen – inside and out ! I thought the same about to have a succulents stamp set. I like the cards but with a heavy heard I’ve decided I need none ;-). I know just what you mean. I thought ‘what on earth…’ when I saw them first but a few good examples and you change your mind. Adorable card, especially the two little pop-up characters inside. Great fun. 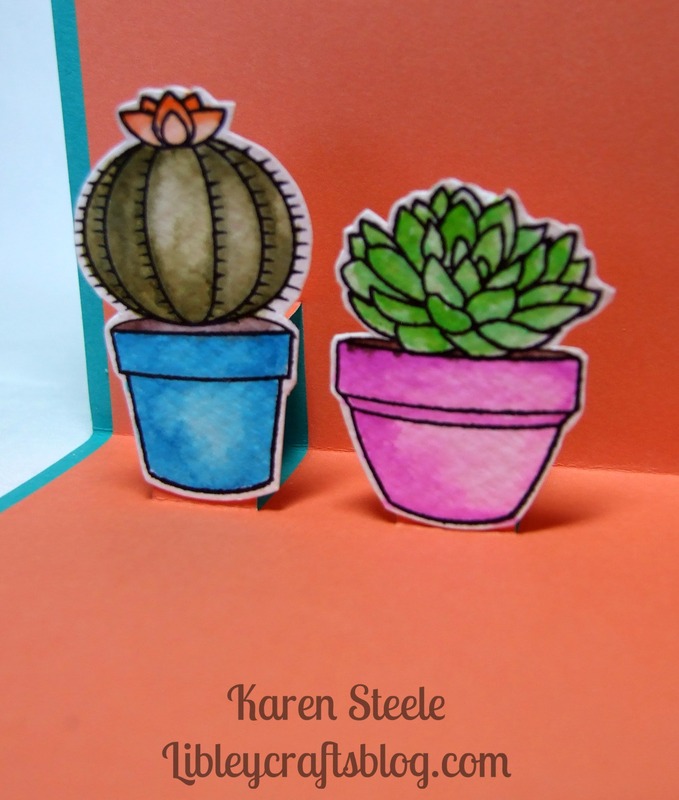 Awesome card with the sweet succulents! Wonderful water coloring! And, love the pop up surprise inside the card!! Love the cacti! Also like the pop up element-great card! Ok, now I want a set like this too! Love these images, so versatile when you think of it. Brilliant idea with the pop ups on the inside, love it!! !